I don’t have a Halloween pumpkin on my porch – but found a crow sitting there today (on the post by steps to my front door). I like Mr Crow’s sharp, inquisitive look, checking me out, as I was snapping his picture. Crows and ravens belong to the Corvid family (which includes jays and magpies) and are considered to be among the most adaptable and intelligent birds. 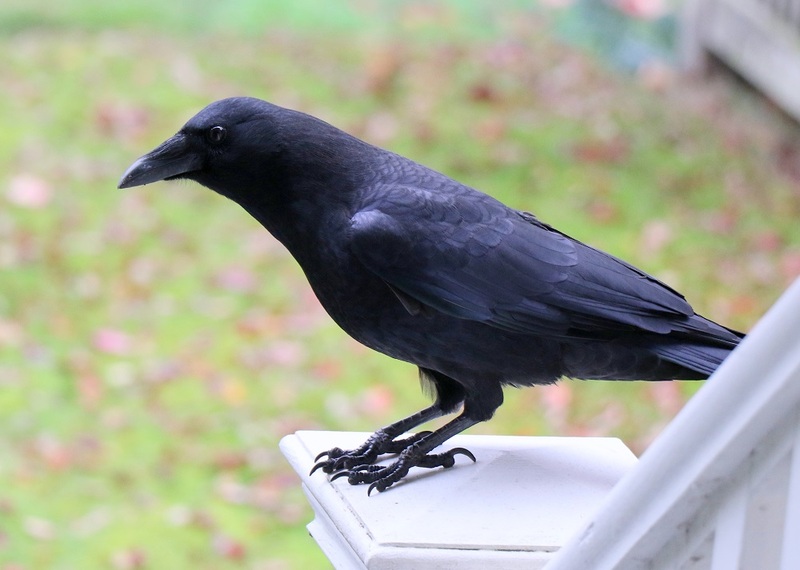 Although most bird books recognize populations along the coast and Puget Sound to be a distinct species called the Northwestern crow (Corvus caurinus), some experts classify the smaller Northwestern crow as a subspecies of the American crow (Corvus brachyrhynchos). [From Washington Dept. of Fish & WIldlife].